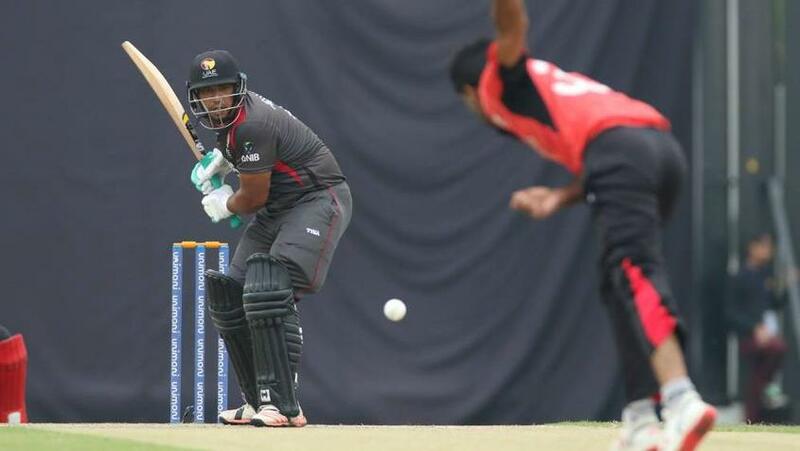 In a rain-affected final of the Asia Cup Qualifier 2018 in Kuala Lumpur, Hong Kong beat the United Arab Emirates by two wickets (DLS method) to book their place in the Asia Cup. A fine five-for from Aizaz Khan first helped Hong Kong restrict UAE to 176/9 in 24 overs, the innings affected by a long rain break, before Hong Kong found enough contributors right through their chase to get to their revised target of 179 with three balls left. Hong Kong, with the benefit of knowing their target and the number of overs at their disposal, started well with Nizakat Khan and Anshuman Rath, two of their most pedigreed batsmen. The two added 64 runs in just six overs to put Hong Kong in front before Rohan Mustafa had Nizakat’s number, sending him back for a 20-ball 38. Then followed a good phase for UAE as Babar Hayat and Kinchit Shah followed Nizakat to the pavilion to leave the scoreboard reading 68/3, which became 82/4 in the 10th over when Ahmed Raza bowled Rath for 28. UAE were in front at that stage, but Christopher Carter (33 in 32 balls) and Ehsan Khan (29 in 24) made sure the game was back on an even keel with a 53-run stand for the fifth wicket. A dramatic game took another turn when Carter was run out and Mohammad Naveed struck twice in one over to leave Hong Kong at a precarious 147/7. 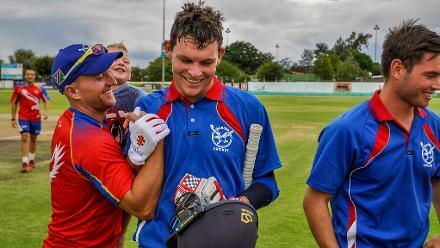 It could have gone either way then, with the target still some runs away, but Scott McKechnie and Tanwir Afzal swung it back, this time decisively, Hong Kong’s way. 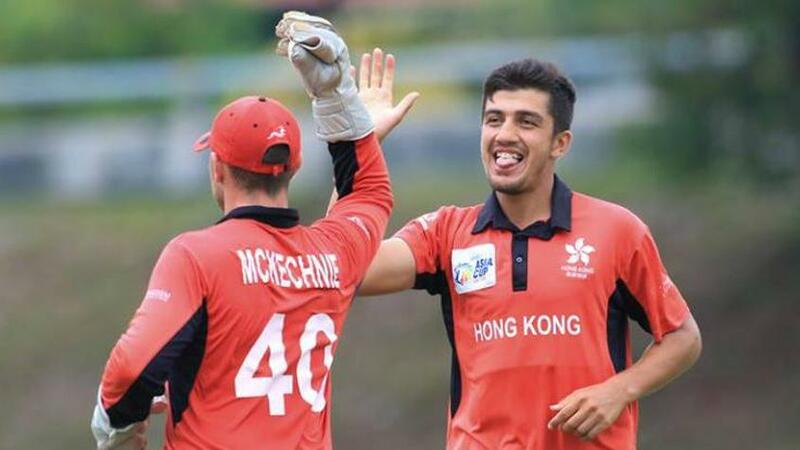 Afzal fell off the last ball of the 23rd over for a 12-ball 15, but Hong Kong only needed three runs then, and they were scored without much fuss, McKechnie ending unbeaten on 14 from 11 balls. Earlier, the UAE innings was a two-part affair, of 15.2 overs first and then 8.4 overs, broken by a long interruption because of rain and a wet outfield. Off the last ball before the players had to go off the field, Aizaz hit Rameez Shahzad’s stumps to send the No.4 batsman back. That left UAE on 65/3 – a slightly slippery slope for a 50-over innings. But Ashfaq Ahmed was still there, unbeaten on 43 in 40 balls at that stage, and he really turned it on once play resumed. When Aizaz came back to finish his over, Ashfaq sent him for a six and a four, and Shaiman Anwar joined the party with six, four and six in the very next over, bowled by Ehsan, as the ball started going to and over the boundary ropes with alarming frequency. There was a brief roadblock in the 20th over of the innings, with both Anwar (22 in 14 balls) and Ashfaq sent back by Nadeem Ahmed, but the blitz didn’t stop. Each of Muhammad Usman, Adnan Mufti, Naveed, Amir Hayat and Abdul Shakoor hit one maximum in their brief stays in the middle, and UAE reached a relatively strong score as a result. Despite the carnage, Aizaz was hugely impressive, his five overs – 3.2 overs before the break and 1.4 after – going for 28 runs as he picked up five wickets with his medium pace. In the end, that made the big difference. Hong Kong will now prepare for their Asia Cup opener against Pakistan, to be played in Dubai on 16 September, followed by the fixture against India, also in Dubai, on 18 September.